It's time to spring clean your closet - and here's how. | HELLO! 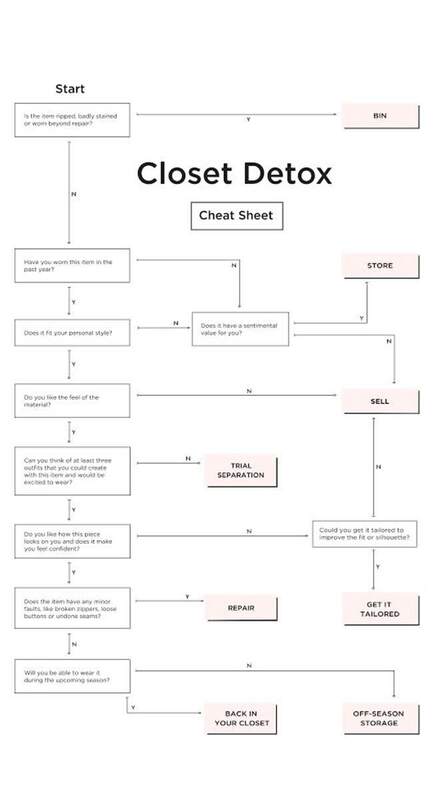 If you've been meaning to spring clean your closet, but don't know where to start, this handy new guide is exactly what you need. Vestiaire Collective has partnered with Anuschka Rees of Into Mind to create the ultimate wardrobe detox guide. It's available to download from vestiairecollection.com and has eight pages on how to minimise the clutter in your wardrobe space, while maintaining key pieces and building the perfect collection. Along with tips on how to part yourself from unnecessary items, there's a 10-step flow chart to make sure you don't slip up. Is it torn, stained or really, really old? Yes. Then it goes in the bin. Have you worn it recently? No. Sell it and make some money back. Can you use it in at least three different outfits? Struggling to think of one. Have a trial separation. But, if it's in good condition, you wear it regularly, it can be mixed and matched to create different looks AND it's suitable for the upcoming season, then you get to keep it. It sounds simple, right? And Anuschka is something of an expert when it comes to building a minimalist wardrobe. She launched Into Mind in 2012, which give tips on how personal style and how not to be a wardrobe hoarder. Anuschka blogs about curating the 'perfect' collection, and says: "A wardrobe that reflects your personal style (instead of the latest trends), consists of high-quality pieces (instead of flimsy polyester bargains), and that makes you feel confident and inspired every day." Download the complete Vestiaire Collective Detox Booklet from www.vestiairecollective.com.